I know its criminal not to have at least seen the movies but, lets be frank here, reading is about a zillion times better than watching, don't you think? I've read books before and absolutely adored them, then watched the film and the love I felt for that book went completely out of the window. When you read a novel, the characters, the landscape are all written for you, often in great depth and detail but somehow our brains and imagination take right over. For example, within The Choice, Gabby and Travis are referred at one point to leaning on a railing on the deck looking out at their back garden. To me, I imagined Gabby leaning on her elbows with her hands together and fingers entwined, whilst Travis is leaning using his hands for support. Now if I go and see the movie and this one little bit from the book is different to my mind, then it completely changes my outlook of the book and honestly ruins it for me. Films are brilliant, don't get me wrong, but everything is decided for you by the producers, directors and actors - I've seen the trailer for The Choice too and both characters are not how I picture them in my head, and this again would just ruin what is a good book. With this view in mind, when I had the email asking if I would like to participate in a new 'Read It Before You See It' campaign for Nicholas Sparks' newest film, The Choice, I jumped at the chance. Travis Parker has it all; a good job, loyal friends, and his dream home in North Carolina. The last thing he is looking for is a serious relationship. That is, until Gabby Holland moves next door. Despite Travis' attempts to be friendly, his alluring neighbour simply will not warm to him. 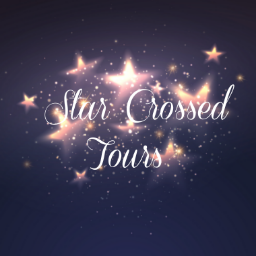 But Travis feels compelled to get closer to her, leading them both down a road where they will face tough decisions, shocking revelations and devastating consequences. 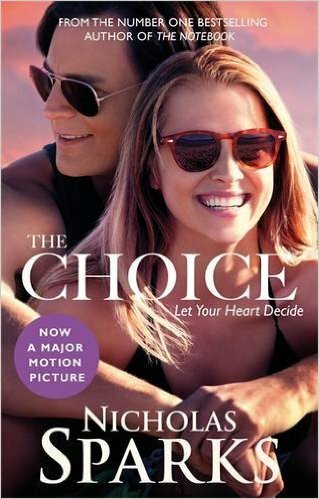 Now a major motion picture, The Choice starring Benjamin Walker and Teresa Palmer, is an unforgettable - and heart-wrenching - love story from Nicholas Sparks, the multi-million-copy best selling author of The Notebook and Dear John. The Choice was a fairly short book in comparison to Nicholas' latest release and clearly was one of his earlier masterpieces, as although I found this easy to read and get into, it didn't leave me as emotionally touched as I was with See Me. The prologue set in February 2007 introduces us to Travis Parker visiting his wife in hospital. We don't know much about what happened but we do know that Travis is living with memories, love and regret as the last he and his wife spoke, they had argued. Part one of the book takes us back to May 1996, and over the next few chapters we get to know Travis and his neighbour, Gabby Holland, and how they met and fell in love. Their early encounters were at times comical - the first words Gabby spoke to Travis were accusations of his dog getting her's pregnant, and we were instantly led to believe that she was a strong, independent and feisty woman. Travis suggests taking the dog to the vet but fails to mention he is the vet - slightly awkward but its the start of a loving relationship. As puppies are born, Travis and Gabby get closer. Over a weekend of fun and flirting they fall in love with each other in the clever, romantic, whirlwind way that Nicholas Sparks is a master at writing and the first choice comes from Gabby as she already has a boyfriend. Part two of the book takes us back to February 2007 and to the hospital with Travis visiting his wife. I found this part of the book slightly slower to read, particularly the first few chapters as we didn't really know what had happened to his wife or what the situation was, but once we learnt that Gabby was in a coma after a horrific car crash all became clear and reading speed again picked up. This is also where Travis has to make the choice of his life. I wont go into it too much and spoil the complete plot, but my gosh it certainly makes you think about life and what you would do in this situation. The last few chapters were tense and I was completely torn with the way the story would take us but certainly showed the power of true love. 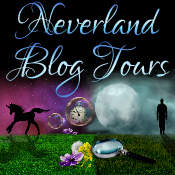 The last part of the book is of course the epilogue set in June 2007. It started with a fast forward of where Travis was from the choice he had made but threw back to a memorable day since. I love a good epilogue, especially one that wraps the story up well and this didn't disappoint. What I loved about The Choice was that although it was written in the third person, we were predominately told Travis' story. It was very descriptive and due to the way it was laid out, it kept my guessing at times on what was going to happen. One of the lovely things about this book is the lack of characters. In the very early chapters we meet some of Travis' friends and sister but they are there more as reference than characters, as are Gabby's parents, which kept this very much as Travis and Gabby and their love story as the focus. Although this book didn't quite move me in the way the last book from this author did, it was still an incredibly powerful, insightful and enjoyable book to read. I urge you to read this before heading to watch the film, and to help out, with thanks to the lovely people at Little, Brown UK, I have been given a copy, SIGNED BY NICHOLAS HIMSELF, to give away to one of my lucky readers - just enter the give-away below! I would also like to thank Stephanie at The Little Book Cafe for providing me with a review copy of the novel and for the giveaway. 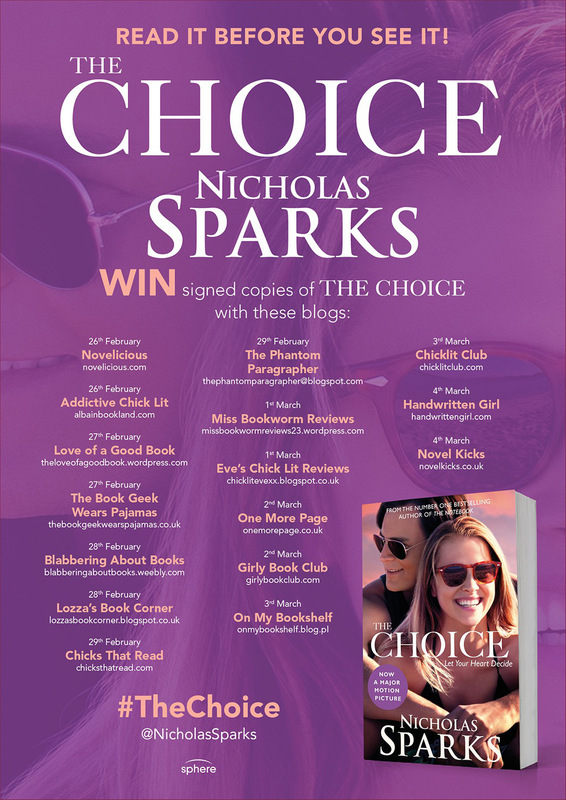 One signed copy of The Choice by Nicholas Sparks. I try to make a point of reading the book before watching the film. I think it's important to have the characters formed in your mind how the author intended first. I have to admit I try and read the book before watching films as I like to see how true to the book the film actually is. Sadly in most cases it's nowhere near but sometimes the film might be different but still be good in its own way. I try and read the book before the film and when I do eventually watch the movie I'm always disappointed as they miss bits of the storyline. So books to me are far better than the movie. I totally agree that a good book can certainly be cheated on, when made into a film. But there are certain film makers who include the authors when planning, and they can do it justice. I love his books and can believe the movie will be true and sensitive, as his books are.